So with two days left till the EU referendum I have been reflecting on final eleventh hour arguments on this issue whilst wondering what we should be worrying about next. Firstly on the EU: ITC’s Board voted unanimously in favour of remaining in the EU and making that position clear and public - ITC is not a registered charity and decided to use its genuinely independent status to encourage debate and make the case on this important issue. 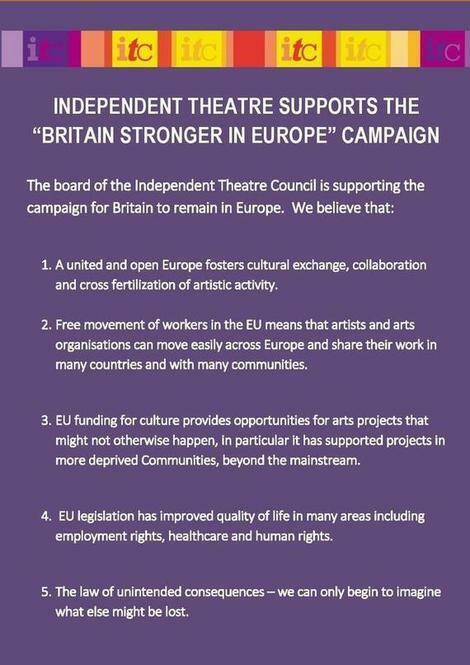 ITC Board member Jo Crowley wrote a blog post on the potential practical implications for independent artists and arts organisations of a Brexit and we produced a five point poster (see right) on the key reasons why Brexit would be disastrous for the arts. For me though the most potent argument in favour of remaining in the EU is one that transcends the practical and economic and was made very potently by Hilary Benn last week. That argument is about peace in Europe and about mature co-operation and partnership between nations being the best hope for peace in the world. The EU is not perfect and needs serious work to operate better but it is a model for international co-operation which, if replicated by other nations across the globe, could foster more peaceful problem solving between countries. The problems of the world are massive and complex – working together with our geographical neighbours and having a coherent structure for co-operation around shared values seems like a good place to start. Working with others to improve that model from within seems a lot more attractive than chucking our toys out of the pram and going it alone. The isolated nation model is very uninspiring – North Korea being a particularly worrying example! Let’s hope that the people of the UK vote on Thursday to keep talking, engaging and working in partnership with our European neighbours. If not the ensuing muddle will distract us politically for years to come and prevent us from addressing many pressing problems both nationally and internationally. So meanwhile what have we been missing? Make sure your MP is aware of the debate and has good information to help them argue the importance of arts and creativity in schools. This is one of many important issues that could slip under the radar while we obsess about the ridiculous EU referendum. Time to refocus and get organised -there’s lots to sort out at home! So sad in fact that I despair! play risk free this game is very famous in world. Synchronization is very important for every sync folders windows 10 and this online tutorial syncs Windows 10 to make this process easy. Do not think about the next thing or next goal, because it is now and how you live it. It matters a lot. Check paper writing service superiorpapers how they react on it and I hope you get direction. I am glad to discover this post. Hope to see more from you. Good luck! It was very informative and thought-provoking topic, similar to the argumentative business essay topics . Yes, the erosion is subtle but very real and moving fast and we must always find a way to prevent it. EU referendum working are so hard for me at least. The https://www.tripodsdslr.com/ is an example of it. The situation in EU is not really for recent years, especially in France, Greece basketball legends We need consensus and determination to stand these difficulties. James Dump him. Yes guys fall into a routine after dating for an extended period of time but that’s just abuse, neglect specifically.